Autism prevalence rates have soared in the last two years, from 1 in 150 children in 2000 to 1 in 68 children in 2010, according the most recent autism surveillance report issued by the Centers for Disease Control and Prevention. But a recent study from Penn State University used federal special education data to suggest that many of those "new" cases of autism are a result of what is called "diagnostic substitution"—instead of children being categorized as intellectually disabled, they're now being categorized as having autism. So that proves that new cases of autism aren't really new at all—just children who are receiving a different label, right? But when you strip away all of that, are there still more cases of autism out there? That's the question researchers are still trying to answer. First, a primer on autism: The disorder is characterized by difficulty in communication, a high reliance on routines, and restricted or repetitive behaviors. In 2013, the DSM-5 got rid of several related disorders, such as Asperger's Syndrome, and classified them all under "autism spectrum disorder." The U.S. Department of Education keeps statistics on how many children under the Individuals with Disabilities Education Act are classified with what disability. As of now, there are 13 disability categories to choose from, and students can receive only one diagnosis. Autism was added as a category in 1990. The Penn State researched used data from 2000 to 2010 to make the point about diagnostic substitution. As genetic researchers, their assertion is that one larger genetic syndrome could lead to a number of different manifestations: while one diagnostician could call it intellectual disability, another person could look at the same set of symptoms and call it autism. The paper was published online July 22 in the American Journal of Medical Genetics Part B.
Autism is a difficult and complicated disorder to diagnose, said Santhosh Girirajan, an assistant professor of biochemistry and molecular biology and of anthropology at Penn State, and the leader of the research team. He likened the disorder to the poem The Blind Men and the Elephant: six blind men, each feeling a part of an elephant, assert that the elephant is like a wall, or a snake, or a rope. All are partially correct, but none of them are able to grasp a sense of the elephant as a whole. "This [study] tells us this is probably one big disorder," Girirajan said. And if so, he suggests, there could be a future where students with disabilities are grouped not just by the name of their disability, but by their specific need. For example, some children with intellectual disabilities and some children with autism and some children with specific learning disabilities could be grouped together to receive therapies that can help all of them. Is relabeling the full story? However, those special education figures were the best we had until 2000, when the CDC started its monitoring program and attempted to bring some rigor to the diagnosis. For its reports, the CDC actively monitors several sites around the country (the most recent report monitored 11 sites) and examines child data reported both from medical and from school sources. Instead of relying on a doctor or a school to say "here is a child with autism," the CDC expert clinicians comb through the records themselves, looking for behaviors that are associated with autism and making their own assessment based on diagnostic criteria. Why does autism prevalence matter? Baio explained that having a good handle on the number of people with autism helps policymakers focus on planning for needed supports and services. 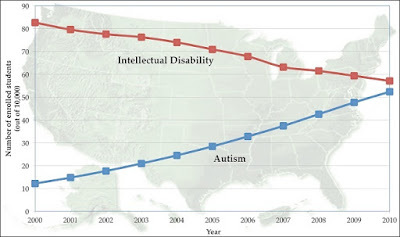 And the CDC collects a great deal more information than just the autism prevalence. "The number is just a number. It represents just a small part of what we collect in the surveillance system," Baio said. "What we collect data on is the placements of these children, the other diagnoses, birth characteristics, adaptive fucntioning—we publish a lot of findings in addition to prevalence." David Mandell, the associate director of the Center for Autism Research at The Children's Hospital of Philadelphia, has criticized the CDC approach to assessing prevalence. Without direct examination of children, there's no way to truly tell how widespread autism may be, Mandell says. But in concurrence with Baio, Mandell said that the prevalence numbers are most valuable if they can be combined with research into causes. Also, Mandell said that reseach into evidence-based interventions that can improve the lives of people with autism is just as valuable. "I think we've gotten quite fixated on the number," said Mandell. "We just haven't done as good a job at making those other things as compelling."